A striking, sixteen-metre tall, totem-esque sculpture is planned for Christchurch’s East Frame, adding a touch of Tongan and Aotearoa New Zealand culture to further complement the city’s cultural diversity and understanding. VAKA ‘A HINA by Tavakefai`ana Sēmisi Fetokai Potauaine is expected to be in place at its location in Rauora Park – on the eastern fringe of the central city – before the end of 2019. The completed Re:ACTIVATE 2018: New Brighton artworks. Basketball court surface – Nathan Ingram FORCES 2018. Wall mural – Josh O’Rourke Low Pressure High Pressure 2018. Image courtesy of the artist and SCAPE Public Art. Photo by Reuben Woods. The people of New Brighton have a new attraction on their doorstep to interact with and enjoy. 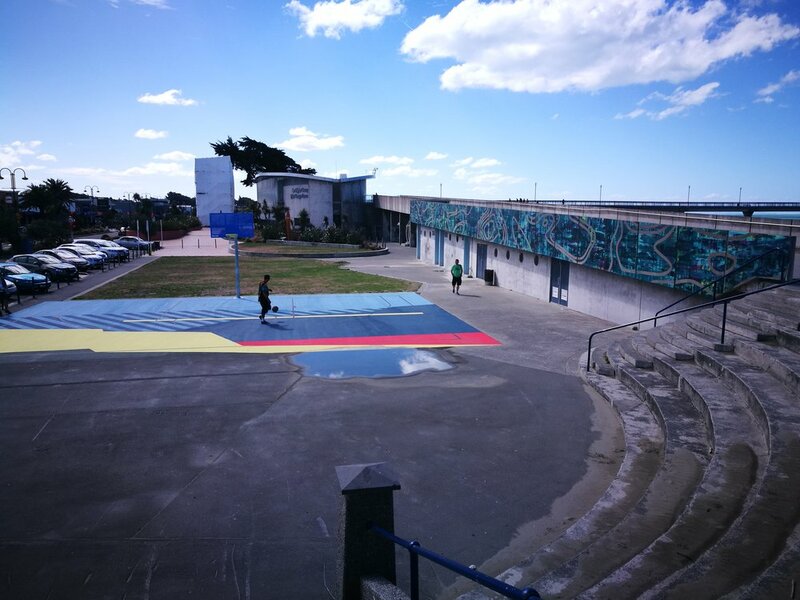 Two vibrant new artworks – one a large mural wall, and the other a bright refresh to the basketball court surface – were completed last week with the finishing touch on Thursday coming in the form of the basketball hoop and backboard. The artworks are the result of the Re:ACTIVATE 2018: New Brighton Emerging Artists competition, an open-call for submissions by artists of any practice and at any stage in their career. The aim of Re:ACTIVATE 2018: New Brighton was to contribute visual art pieces to the regeneration of spaces in New Brighton, so that there are more unique offerings in the neighbourhood both for locals to enjoy and to attract visitors. Both artworks are abstract-based and have taken inspiration from the forces of nature that so strongly impact on this coastline suburb, with both artists living locally in New Brighton. The wall mural, Low Pressure High Pressure by Josh O’Rourke, is a painted watercolour blend of seafoam colours with the original concrete surface exposed to form globular rings, delineating a topographic weather map. The artist, also a keen surfer, has spent a lot of time with weather maps, predicting conditions of the day, and his artwork symbolises the impact these weather systems have on local residents and visitors in New Brighton. O’Rourke is a graduate of University of Canterbury Ilam School of Fine Arts, in Painting. He has exhibited widely throughout Christchurch and New Zealand, this is his first large-scale outdoor artwork. FORCES by Nathan Ingram is the second artwork which electrifies the surface of a basketball half court, hoop and backboard. The geometric designs and bold colours represent the Māori concept of ‘forces of nature’ that define the unique character of New Brighton. The dunes, the wind, the source of mahinga kai and kai moana, the place where the sea meets the sky – the place and home for him and others who live there. Ingram has a Bachelor of Design in Applied Visual Arts from Ara Institute, and extensive experience in fashion and design industries. To celebrate the completion of the two Re:ACTIVATE 2018: New Brighton artworks there will be a gathering on the site, South of the Pier, with a free sausage sizzle and casual basketball games organised for youngsters and older players. Everyone is welcome to come along on Wednesday 6 March, beginning at 4:30pm. It’s an opportunity to meet the artists, SCAPE and DCL teams who put the projects together, and be some of the first to experience the excitement these artworks radiate. * SCAPE Public Art will again run Re:ACTIVATE competitions in 2019 and 2020; the first for kids/youth and the second one for emerging adult artists. Keep an eye out on SCAPE’s website in the coming months for more details on how to enter www.scapepublicart.org.nz. Visitors exploring David McCracken Diminish and Ascend 2013 during Opening Weekend of the SCAPE Season 2018. Image courtesy of SCAPE Public Art and Gow Langsford Gallery. 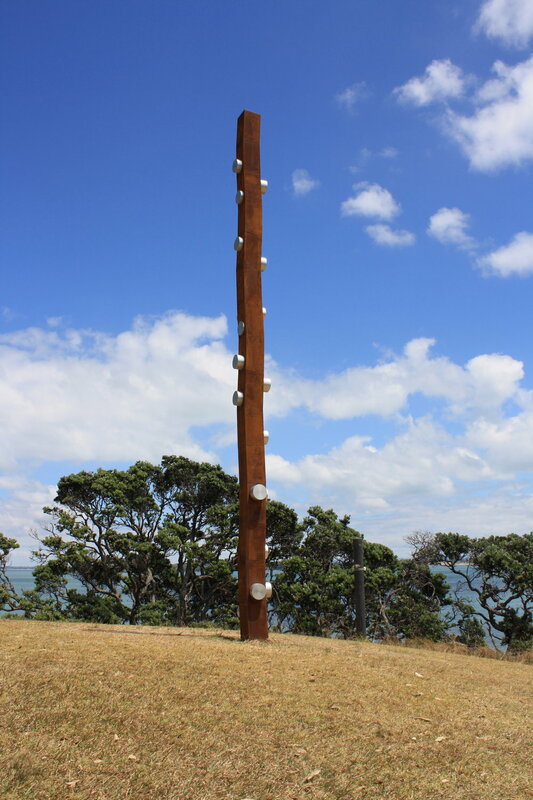 Today, SCAPE Public Art has launched a crowd funding campaign on Boosted.org.nz to raise $20,000 for sculpture Diminish and Ascend by David McCracken. The money raised will help fund the improvements required to make the staircase a permanent fixture in Kiosk Lake within the Christchurch Botanic Gardens. The popular sculpture has surprised many locals and visitors who have stumbled upon its illusion, beauty and intrigue since it was unveiled as part of the Public Art Walkway for the SCAPE Season 2016. In late 2018, an announcement was made by the Christchurch City Council that the sculpture would become permanent for Christchurch. The purchase of this popular legacy (permanent) public artwork for Christchurch is an excellent example of a mixed funding model. Supporters have ranged from the local organisations, such as the Friends of Christchurch Botanic Gardens, to gallerists Gow Langsford donating their commission to make it possible. The total cost of purchasing the artwork is $220,000 made up of combined support from those mentioned, SCAPE Public Art, Cranleigh Harper Barton Cultural Trust, Leighs Construction, Anderson Lloyd, Ruamoko Engineers and the Christchurch City Council Public Art Fund. Those involved having already achieved $180,000 of the budget needed. SCAPE is aiming to secure the last $40,000 through a combination of a public appeal and cash sponsorship. In this Boosted campaign, SCAPE will encourage others to step up and make donations whether they be as individuals, schools, businesses or other groups. The campaign will run for three months, from 20 February – 20 May 2019. The campaign, entitled WANTED: Artwork for Gardens, takes a contemporary approach to a wild, wild west wanted poster with the sculpture having a $20,000 ‘target’ looming over it – meaning the campaign target is to raise $20,000 to go towards the artwork – and various ‘hys-stair-rical’ puns. The campaign is running through arts funding website Boosted, created and administered by the Arts Foundation, and can be pin-pointed using the link: www.boosted.org.nz/projects/wanted-artwork-for-the-gardens. Everyone who donates will be recognised on an honour board on SCAPE’s website, and through an emailed letter of thanks upon reaching the target. Donors will also receive a donation receipt for tax purposes. The sculpture itself – a seemingly infinite staircase by Auckland-based artist, David McCracken – is a much-loved meeting point, picnic spot, place to ponder and avian playground in the Christchurch Botanic Gardens. The way it sits within its surroundings is thoughtful and peaceful. Through clever use of scale and perspective, the sculpture ascends from Kiosk Lake and disappears into the surrounding tree canopy, its width tapering off and steps becoming smaller and smaller before reaching its apex. It is a rare feat that a sculpture and its location combine so effortlessly, so securing both for many years to come will be a special endeavour for everyone involved. *To donate any amount from $5 to $1,000+ please visit: www.boosted.org.nz/projects/wanted-artwork-for-the-gardens. Emma Bugden, Managing Curator, SCAPE Public Art. Image courtesy of SCAPE Public Art. Photo by Jade Cavalcante. New Zealander Emma Bugden, is announced as the new Managing Curator of SCAPE Public Art, responsible for the selected exhibition element of the SCAPE Public Art Season 2019 through to 2021, a three-year tenure. Bugden has carved out a career in the arts over two decades. She is a recognised curator, writer, editor and contemporary art maven holding key roles including Senior Curator at the Dowse Art Museum in Lower Hutt, Director of the Physics Room in Christchurch, Director of ARTSPACE in Auckland, Curatorial Director at Te Tuhi Centre for the Arts in Auckland, and Curator at City Gallery Wellington. Originally trained as an artist, she has worked as a curator for both independent spaces and public art museums, holding key leadership roles within the sector. She has worked with over 100 artists to realise ambitious and challenging exhibitions that have toured New Zealand. Bugden has a reputation as a fierce advocate for artists with a passionate belief in the power of art to transform and enrich communities. Bugden has served on numerous panels and trusts. She was New Zealand Nominator for the Signature Art Prize 2018 at the Singapore Art Museum and a Juror for the 2016 Walters Prize. “It is wonderful to have the opportunity to work with SCAPE and I feel energised to work with artists in city spaces to present public art to excite and engage viewers of all ages,” said Bugden. “I have watched the Seasons develop over the years, evolving into a high voltage art event that measures the city’s heartbeat and puts the results where everybody can see them." The announcement comes after the completion of a three-year curatorial term by Heather Galbraith, Professor of Fine Arts at Massey University, who worked with dozens of artists over that time to select artworks that have been developed, commissioned, and sited in response to the central city of Ōtautahi Christchurch. The art trail the selected artworks create, and SCAPE’s wider programme of events, has become synonymous with Christchurch in spring – drawing large crowds both locally, nationally and internationally. Over 20 years, SCAPE Public Art has become the largest producer of new contemporary artwork in New Zealand. “We are absolutely delighted to bring Emma on board and know she will make a meaningful contribution as we grow and build on the excellent legacy of artistic direction over the last twenty years of SCAPE,” said Deborah McCormick, Executive Director of SCAPE Public Art. 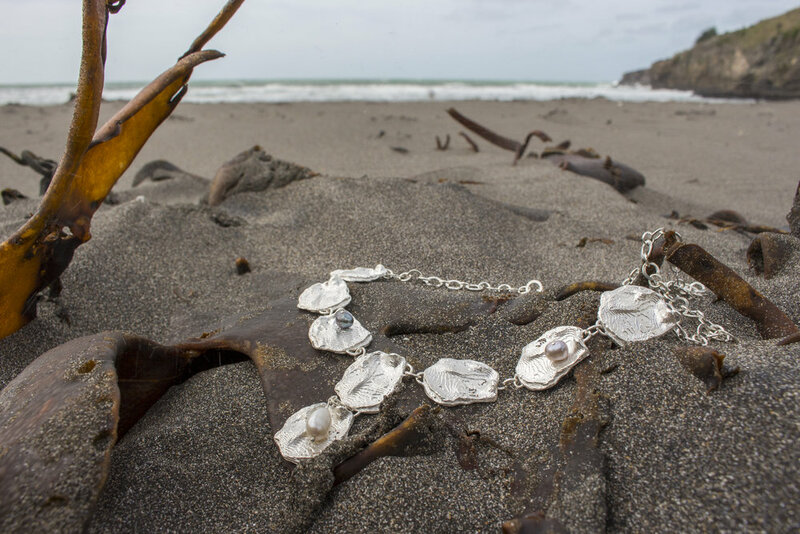 Bugden’s artwork selection will be on show in a range of spaces around Christchurch forming part of a broader six-week event for the city between Saturday 5 October – Saturday 16 November 2019. Paul Hartigan Alphabetica Redux 2004/18. The artist previews his work in the Christchurch Art Gallery Te Puna o Waiwhetū. Image courtesy of the artist and SCAPE Public Art. Photo by Jade Cavalcante. This spring festival, a world-class art event comes into full bloom in Christchurch in October. It is the 20th anniversary of the annual SCAPE Public Art festival so expect celebrations to be large-scale, impressive and unforgettable. A towering bronze sculpture by world renowned artist Tony Cragg, a glittering gala dinner with Justin Paton (Curator of International Art at the Art Gallery of New South Wales and famed author of How to Look at a Painting), and more than a dozen daring new public artworks for Christchurch by some of the most exciting artists in the world, are just a few of the offerings that make up the SCAPE Public Art Season 2018 (6 October - 17 November). The 5.5m metre tall, bronze sculpture Mixed Feelings by Tony Cragg has already been announced as one of the SCAPE Season 2018 artworks, with further contributing projects to be revealed as the countdown ticks towards Friday 5 October – when Opening Weekend begins. The announcement of artworks now flows into the build towards the Season opening and includes favourites by artists returning from Seasons past; Michel de Broin, Paul Hartigan and Caroline Rothwell. New presentations include a selection from Tom Dale, Hannah Beehre, Erica van Zon, Piri Cowie, Brett Graham, Chris Ulutupu, Ben Pearce and George Rickey. The 20th anniversary will also be marked by the permanent installation of artworks by Nathan Pohio, David McCracken and a new commission by Sēmisi Fetokai Potauaine. Eclectic, artistic, intellectually enquiring and a little bit off the wall – this is the Christchurch that locals know and love. Where the city’s charms were largely shrouded during the post-earthquake rebuild, the revitalisation of many places of significance and nostalgia is seeing this uniquely Christchurch spirit radiate once again in its people and spaces. Christchurch is a city building a reputation for its urban art and ingenuity in hospitality, architecture and public spaces. The combination of old and new – the beloved Christchurch Trams, Tūranga (the city’s new state of the art central city library), the Arts Centre, Christchurch Art Gallery Te Puna o Waiwhetū, CoCA, the Botanic Gardens – all will feature as locations in this SCAPE Season. “We have been growing the SCAPE Seasons over 20 years, and now, featuring the likes of Tony Cragg and Justin Paton, the high calibre of the event is front and centre. It’s a must-see for both arts professionals and enthusiasts. Our offering is free-to-view and particpate in – the festival is truly for everyone,” she said. SCAPE Curator, Heather Galbraith’s selection is based on the theme Our Braided Future. The public can view the artworks – for free – and participate in a diverse public programme, during the six-week Season, from Saturday 6 October – Saturday 17 November 2018. But to taste the festival at it’s freshest, when the artworks are the talk of the town, and artists and curator are visiting for the big reveal, one must consider attending the opening weekend. A weekend of intense art appreciation, it’s your time to mingle with the people and artists involved, hear behind-the-scenes stories, and be one of the first to interact with the artworks and limited-time-only activities arranged to compliment their opening. Lights, camera, action! Friday (5 October) evening will commence with a vibrant whānau fashion show in the Arts Centre’s Great Hall. With artistic direction from Ngāi Tahu artist, Piri Cowie, every garment has been painstakingly thought through, using only natural dyes and customised patterns inspired by nature and her Ngāi Tahu cultural heritage. Beyond Opening Weekend, Piri’s works will transform into a participatory project. The event will feature kapa haka, waiata, mahinga kai and unique taonga made by the artist. I am the Ocean and the Ocean is me. The same night, watch as the foyer and façade of Christchurch Art Gallery Te Puna o Waiwhetū is illuminated in a kaleidoscope of multi-coloured lights moving and reflecting around the architecture and surfaces. Paul Hartigan’s, Alphabetica Redux 2004/18 is a blast from the past, one of the people’s favourites from an earlier SCAPE Season returning as part of 20th anniversary celebrations. He’ll be on-site drawing the images live as they’re projected, on 5 October 2018 only. It’s an immersive and otherworldly experience, a 3D visual spectacle that brings the space to life after dark. 20th anniversary celebrations; the glittering black tie Gala Dinner and the Anderson Lloyd SCAPE Public Art Business and Arts Partnership Awards ceremony, begins. It will be a night of sublime entertainment; including a certain raven haired trubador who cannot yet be officially announced (stay tuned for updates...), and the acclaimed guest speaker Justin Paton. Tables of corporate sponsors, art influencers, plus you and yours (secure your tickets now), will be dining with the SCAPE artists, swinging to the fabulous live music, and diving into the inner workings of one of the most prolific public art producing organisations in New Zealand. It only comes around every 20 years, and it’s an extraordinary history worthy of celebration. Sunday (7 October) will be one for learning, exploring, discovering and lively discussion. There are many opportunities to get out in the spring sunshine on the Public Art Walkway guided walks, or take your chance to ask a question of our artists during public talks. It’s astounding how much thought and preparation goes into a SCAPE Season artwork, and attendees can pick up some cool insider tips to be shared with friends next time you’re in central Christchurch. Rachael Dewhirst, Kaleidoscopic Nights, 2012. The winning submission in the first Re:ACTIVATE competition, Resene Art in the Streets 2012. Image courtesy of the artist and SCAPE Public Art. Ever dreamed your art would be visible from space? That millions of people worldwide could zoom into it with the click of a mouse? Christchurch’s freshest art competition asks participants to design a basketball court, or huge mural wall visible on Google Earth. The competition, titled Re:ACTIVATE 2018: New Brighton, will see two new, community-driven public artworks enliven the foreshore of New Brighton. The coastal Christchurch suburb, an area hit hard by the Canterbury quakes, is already building a name for itself as a creative hub with a vibrant art and street art scene, and any artists over the age of 18 now have the opportunity to make their mark. Re:ACTIVATE 2018: New Brighton is run by SCAPE Public Art. It is not a new initiative, but it is the first time exhibition of the winning artworks has been held in a location outside the Christchurch CBD and in conjunction with Development Christchurch Ltd (DCL). SCAPE has been delivering high quality artworks through Re:ACTIVATE every two years since 2012, and as part of this, has achieved significant attention and visitation to the exhibition sites, and boosted support for local artists. The winner of the first Re:ACTIVATE competition, Resene Art in The Streets, was Rachael Dewhirst with her mural Kaleidoscopic Nights, 2012. At the time, she was a Fine Arts honours student at the University of Canterbury and has since gone on to establish her place as a full-time artist, exhibiting widely around New Zealand and having such distinctions as; finalist in the Parkin Prize, 2016 and her work in the collections of the James Wallace Trust and the University of Canterbury. SCAPE Public Art Executive Director Deborah McCormick is excited to be able to facilitate the competition for artists once again. “Re:ACTIVATE is a great opportunity for anyone who considers themselves an artist, whatever stage they may be at, to have their work selected and exhibited in large-scale, visible to a wide audience,” she said. Inspiration for the competition brief has developed from Project Backboard, a non-profit organisation in the USA that refurbishes neighbourhood basketball courts by covering them in art. Participating areas have seen increased usage of public courts and parks, and greater inter-generational play, helping people to understand each other and strengthen communities, and it is hoped the combination of art and sport will have a similar effect in Christchurch. There is strong support in New Brighton for public art initiatives, according to the responses in the recent DCL residents’ survey conducted in April 2018. Survey responses identified public art in the area as one of the top priorities. Anyone over the age of 18 can enter Re:ACTIVATE 2018: New Brighton, and all entrants are encouraged to attend the 4th Re:ACTIVATE Public Art Development Workshop first. The workshop is a practical guide for local and emerging artists, and tertiary art and design students. It covers all elements of public art delivery, including; how to respond to a brief and explore site issues, practical production requirements and expectations of delivery frameworks, funding, budgets and contracts, and the unique climate of creative opportunities in the city at present. “Anyone with a vision for this space, even if you’re not sure how to convey it into a proposal, should come along to the workshop on 7 August. You’ll have a chance to talk to the people involved, learn more about how public art is produced and how to get your work out there,” says Deborah McCormick. Winners will be selected by a panel made up of local community members, key organisations and art experts. Judging will take into consideration artistic quality as well as fit for the local area and its people. The winning design for the basketball court will be implemented by Park-Life www.parklife.co.nz later this year. The 4th Re:ACTIVATE Public Art Development Workshop will be held on Tuesday 7 August 2018 4pm - 8pm at the Grace Vineyard Church, 111-113 Seaview Road, New Brighton. It is free to attend. Registration is essential, register online here. There are 50 places available. Re:ACTIVATE 2018: New Brighton is an open call to all emerging artists over the age of 18. The two briefs will be provided at the workshop, and are available online here. Submission deadline is Thursday 30 August 2018. Email further enquiries to education@scapepublicart.org.nz. Tony Cragg, Mixed Feelings, 2012, 550x236x224 bronze. Presented for SCAPE Season 2018. Image courtesy of the artist and Gow Langsford Gallery. Photo by Michael Richter. British sculptor Tony Cragg, widely recognised as one of the most acclaimed artists of his generation, is announced as part of Our Braided Future the curated element of the SCAPE Public Art Season 2018. The artwork is being shipped to Christchurch from Europe and will arrive ahead of the annual six-week SCAPE Season (Saturday 6 October – Saturday 17 November), but will remain in the city throughout summer. The large-scale 5.5m bronze sculpture will form part of the central city SCAPE Public Art Walkway. The art trail, and SCAPE’s wider programme of events, has become synonymous with Christchurch in spring – drawing large crowds both locally, nationally and internationally. “We are absolutely delighted to bring Tony Cragg’s Mixed Feelings to Christchurch, his first large-scale presentation of public artwork in New Zealand. In our twentieth year the Season 2018 will be our most comprehensive presentation to date,” said Deborah McCormick, Executive Director of SCAPE Public Art. Mixed Feelings, 2012 will be in residence at Christ’s College Quadrangle, a grass canvas that has become familiar to the annual presentations of SCAPE. The piece is an immense glowing monument, formed by two intertwining bronze towers, pushing together and pulling apart as they spiral towards the sky. As the viewer circles the piece, human profiles come into and out of focus. Each tower of feeling exerts a gravitational pull on the other, creating a unique, pulsating form of energy. Previously exhibited in London, Prague and Amsterdam amongst others, the artwork is on loan to SCAPE Public Art courtesy of the Gow Langsford Gallery in Auckland who have built a relationship with the artist over many years. A crucial piece to the success of this project was the vision and dedication of one of the Founding Directors Gary Langsford MNZM, to bring the artwork to Christchurch. “It is wonderful to have the opportunity to work with SCAPE in its 20th year. They’ve been pioneering and ambitious in bringing world-class public art to Christchurch,” said Gary Langsford MNZM, Founding Director of Gow Langsford Gallery. “Our organisations have enjoyed a long and mutually beneficial relationship, and the 20th anniversary of SCAPE provided the perfect opportunity to bring a monumental work by Tony Cragg to New Zealand,” Langsford said. The Philipp Family Foundation are also responsible for funding towards the cost of freight, insurance, exhibition and an associated education resource which will bring many children into the city centre to visit, interact and enjoy the artwork. The Philipp Family Foundation were also integral in securing Seung Yul Oh’s, Conduct Cumulus, 2017 for the South Quadrangle in the newly refurbished site within the Arts Centre. In the third Season of her three-year curatorial tenure of SCAPE, Heather Galbraith (Professor of Fine Arts at Massey University) has taken the 20th anniversary of SCAPE Public Art as an opportunity to look back at the artworks that have been developed, commissioned, and sited in response to the central city of Ōtautahi, as well as to cast our minds to the possible futures facing the city and its peoples. The 2018 artworks respond to the theme of Our Braided Future. The tapestry of understanding cannot be woven by one thread alone. The selection will be on show in a range of spaces around Christchurch and are part of a broader six-week event for the city between Saturday 6 October – Saturday 17 November 2018. Studio 125 Gallery is a contemporary art gallery supporting public art in the city. Located at 125 Aikmans Road, Merivale, Christchurch. Enjoy a new range of exclusive editions to mark our 20th anniversary from: Neil Dawson, Seung Yul Oh, Sarah Greig, Nina Oberg Humphries and Phil Price. This exhibition will link to sculptures, paintings, photographs, ceramics and limited editions by artists associated with SCAPE. Thursday & Friday 11-5pm, Saturday 10-4pm. Seung Yul Oh Conduct Cumulus 2017. Auckland and Seoul-based artist Seung Yul Oh presented Conduct Cumulus 2017 as part of Time in Space (territories and flow), to complete the curated element of the SCAPE Public Art Season 2017. A community of oversize bubbles will drift across the lawn of the South Quadrangle in the newly refurbished site with a long, rich history of public use and cultural activity. Conduct Cumulus, with its light and playful tone, is the first public commission in the South Island by Oh. The artist has observed our enduring fascination with bubbles, such as during family time with children at play, and celebratory events such as children’s birthday parties. Bubbles also have interesting properties for those who see beyond beautiful floating spheres. No matter what shape it has initially, a bubble will try to become a sphere – the shape that maximises the surface area and requires the least energy to achieve. When one bubble meets another, the resulting union is always one of total sharing and compromise. The Philipp Family Foundation are responsible for significant funding towards the cost of the public artwork and an associated education resource which will bring many children into the city centre to visit, interact and enjoy the artwork. Leighs Construction have significantly contributed to the installation, in keeping with the art and industry sponsorship model SCAPE has successfully developed over the last, almost, 20 years. Both align to the idea that public art lends itself well to strengthening community and public engagement in the evolving city of Christchurch. Leighs Construction is presently on site at the Arts Centre delivering the CE West Theatre Restoration project. Past public art projects Leighs Construction has installed for SCAPE include Neil Dawson’s Fanfare 2014/15 and David McCracken’s Diminish and Ascend 2014. The artist wants the work to honour the extraordinary actions and energies of Christchurch citizens, working individually and collectively through self-determined groups and communities of interest to rebuild their city post-quakes. The ‘Conduct’ within the title of the work refers to the idea of an orchestra where individual parts are conducted to form a unified rhythm of units. ‘Cumulus’ refers to an accumulation of airborne particles that appear to be shaped and directed by forces such as wind. The location of Rutherford’s Den and the history of the Arts Centre as a haven for families and culture also found an echo with the conceptual development of this work. In the second Season of her three-year curatorial tenure of SCAPE, Heather Galbraith has celebrated artworks which explore how different understandings of time (geological, cultural, cosmological), and alternative ways of recounting histories combine to shape a sense of place. The 2017 artworks have been shown in a range of spaces around Christchurch, with many remaining in place beyond the planned Season to be enjoyed in the city for early summer. Born in Seoul, Korea in 1981, Seung Yul Oh moved to New Zealand 15 years ago and completed an MFA at Auckland University's Elam School of Fine Arts. He now divides his time between Auckland and Seoul. British artist Tom Dale's Terminal Blue, 2017 is one of fourteen new artworks for the SCAPE Public Art Season 2017, entitled Time in Space (territories and flow), curated by Heather Galbraith. Terminal Blue is part artwork, part performance, consisting of a sky banner soaring across the sky. Christchurch-born artist Wayne Barrar and Auckland-based Anton Parsons are the first artists to be announced as part of Time in Space (territories and flow), the curated element of the SCAPE Public Art 2017 Season. Wayne Barrar’s In/Visible Landscape 2017 drawn from his extensive series of photographs The Glass Archive, will feature on a large banner on the outside of the Canterbury Museum, and billboards at seven locations across Hagley Park, with further pieces displayed inside the Museum. The Glass Archive is a large body of photographs exploring the extraction, arrangement and circulation of diatoms and other microfossils for scientific study. Diatoms are comprised of tiny silica skeletons, remnants of algae from millions of years ago and are often found as fossils in diatomite deposits. Glass slides of diatoms were sold to amateur Victorian microscopists, and have been photographed by Barrar through a microscope, enabling us to view the detailed forms and patterns not normally visible to the naked eye. 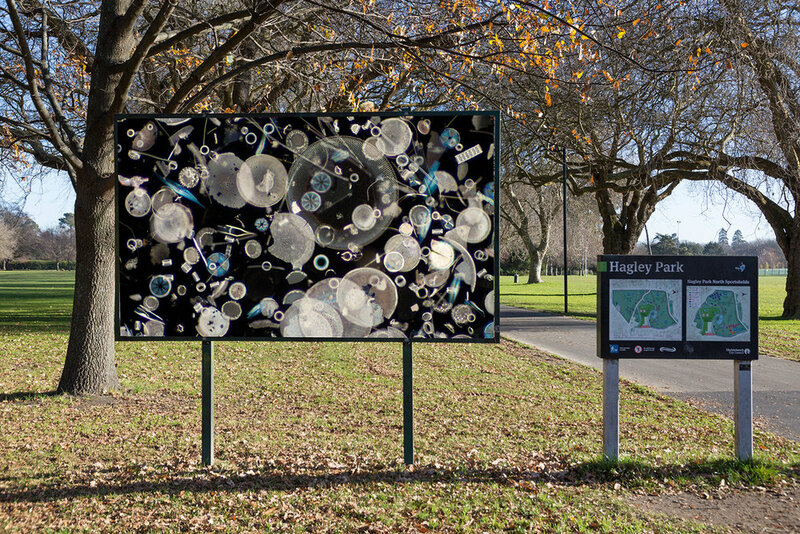 Seven-large billboard works in Hagley Park including of fossil marine diatoms photographed through a microscope compliment a large banner on the front of the Canterbury Museum, and a giant colour pigment print in the main foyer, both featuring arranged diatoms. Continuing a long association with SCAPE Public Art, Anderson Lloyd are again involved in the Season, and are the major sponsor of Barrar’s work. Anton Parsons work comprises two impressive sculptures forged from metal. Myopia and Acquiesce are in residence at Christ’s College Quadrangle. Myopia 2017 explores ideas about distance (both physical and metaphorical) and perceptions of the world depending on where you see things from. The aluminium rounds are spaced out in braille to spell ‘myopia’ and ‘hyperopia’. These terms are often used to describe conditions of sight (myopia – shortsighted, hyperopia – longsighted), and the work invites us to consider different ways to perceive the world. Acquiesce 2017 also features patterning that is in braille, but the meaning of the text is more ambiguous. It could be a highly sophisticated code, or pure decoration. The form of Acquiesce is an abbreviated version of the seam of a tennis ball, a linear shape that Parsons has been working with since 2006. This seam is a clever geometrical solution to form a robust 3-D sphere from a 2-D surface. Here the form has less of a utilitarian role, and more a metaphorical one. It has no beginning or finishing point, it is endless. The application of braille to a 3-D four-sided profile further challenges a simple translation, and offers the viewer scope for interpretation. Anton Parsons is a long-time collaborating artist with SCAPE. Passing Time, was created for the 6th SCAPE, and installed only a few days prior to the Christchurch earthquake on 22 February 2011. In the second Season of her three-year curatorial tenure of SCAPE, Heather Galbraith is celebrating artworks which explore how different understandings of time (geological, cultural, cosmological), and alternative ways of recounting histories combine to shape a sense of place. The 2017 artworks will be on show in a range of spaces around Christchurch, with Canterbury Museum acting as the starting point for the exhibition’s Public Art Walkway. The works by Barrar and Parsons bring visual and symbolic impact to these pockets of the city, connecting to form an integral part of the SCAPE Season 2017 Public Art Walkway. Wayne Barrar is an Associate Professor at Whiti o Rehua School of Art at Massey University, Wellington. His photography has been widely exhibited and published internationally since the 1980s, and his work is held in major national and metropolitan collections. Publications include the monographic books – Shifting Nature, University of Otago Press 2001, An Expanding Subterra, Dunedin Public Art Gallery 2010, Torbay tī kōuka: A New Zealand tree in the English Riviera, University of Plymouth Press 2011, and The Glass Archive: Photographs by Wayne Barrar, 2016.